Online poker pro, Luke “FullFlush1” Schwartz, is no stranger to bans –Full Tilt has revoked his chat privileges in the past, which caused Scwartz to switch sites– but his current ban from an entire poker tour is unprecedented! The initial transgression came when Schwartz refused to remove his hat at the Vic Casino in London: Schwartz then had a fellow poker pro vouch for him in order to attend the EPT in London this past week. After an uneventful run of tournament, Schwartz was able to make it all the way until the Main Event before his next outburst; which happened in, of all places, the food line! After busting out of the tournament “FullFlush1” decided to go get a sandwich, and lo and behold they wanted him to pay for it! The nerve! Schwartz was apparently of the mind-set that high-rollers don’t have to pay for sandwiches (why a high-roller is getting a sandwich instead of a filet mignon is beyond me) and an argument ensued. 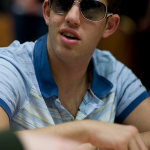 The result of the whole fiasco is Schwartz’s banning for the remainder of the EPT season. Hopefully, the penalty will seep into his head that despite being a young talented poker player, you are not entitled to act like a spoiled brat. This entry was posted on Thursday, October 8th, 2009 at 7:36 pm and is filed under Poker News. You can follow any responses to this entry through the RSS 2.0 feed. You can leave a response, or trackback from your own site.